We’ve all had those nights when we wake up the next morning wondering what exactly happened. How did we get home safe? Did we do anything we might regret? Evelyn (Meghan Gardiner) is a regular at her local bar. She knows the whole karaoke catalogue by heart, and she loves to give the bartender, Melissa (Agnes Tong), a hard time. 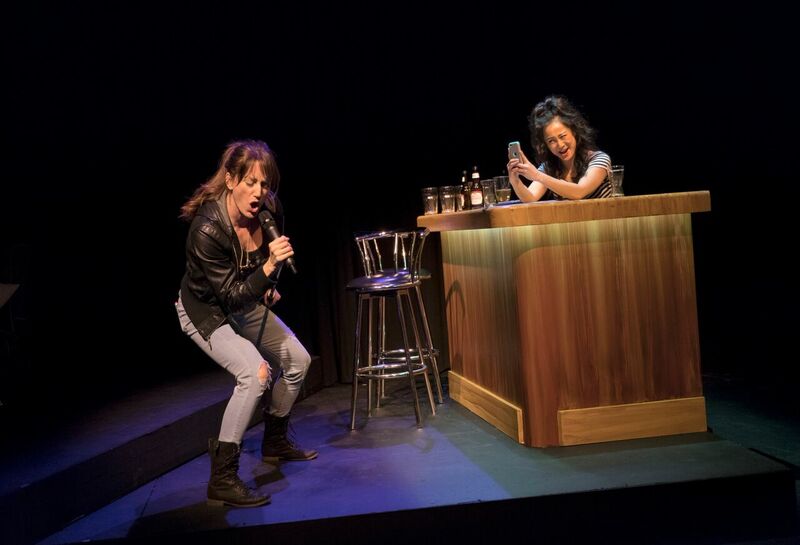 One night, after a few too many beers, Evelyn and Melissa end up in a karaoke bet — with Evelyn’s husband as the prize. Catherine Léger’s play, J’ai perdu mon mari, has been translated by Leanna Brodie and is directed by Ruby Slippers Artistic Director Diane Brown for this English language premiere. Full of odd couples and unusual circumstances, the story can’t help but be amusing as Evelyn wonders whether her husband Peter will come home, and if she even wants him to. While Peter spends some time at Melissa’s place, Evelyn hangs out with Peter’s pot smoking layabout son, William (Curtis Tweedie). Frequently joining them is William’s dealer, Steve (Raugi Yu), who shares words of wisdom about his entrepreneurial lifestyle. Evelyn, with her failing frozen yogurt stand and dreams of owning a Tim Horton’s, also sees herself as an entrepreneur, rebel, and non-conformist. She’s not sure what she wants to do with her life other than drink beer and belt out the karaoke tunes. Much of the comedy comes from the generation gaps between the characters. Although Melissa was interested in Peter, she is actually the same age as his son, who has a huge crush on her. Tweedie was spot on as the nerdy, awkward William, as he tries to flirt with her while listening to her talk about his dad. Evelyn is between Melissa and Peter in age, but closer to Melissa in maturity level. Passionate and authentic, Gardiner has us on Evelyn’s side right from the first scene. When she talks to her therapist, it’s as if she’s pouring her heart out to the audience, letting us see her vulnerabilities and weaknesses. Each of these characters has their own hang-ups to get over, and through this husband borrowing exercise they all learn a lot about themselves. I Lost My Husband will have you laughing out loud while considering your own definition of freedom.